א,ב שמעון הצדיק היה משיירי אנשי כנסת הגדולה. הוא היה אומר, על שלושה דברים העולם עומד–על התורה, ועל העבודה, ועל גמילות החסדים. 2. Shimon the Righteous was among the last surviving members of the Great assembly. 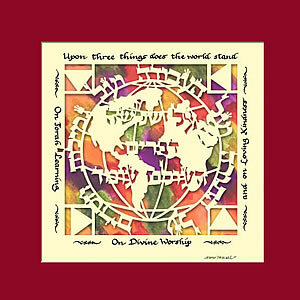 He would say: The world stands on three things: Torah, the service of G-d, and deeds of kindness. The Anshei Knesset never replaced itself so as the 120 members died so the Knesset dwindled. Shimon Hatzadik was one of the last surviving members of the Knesset Hagedolah. Shimon Hatzadik greeted Alexander the Great – the Talmud relates a story where the Emperor dismounted and kneeled before Shimon Hatzadik, saying that he had seen his face in a dream and it was that face which guided him to win a battle. He became the Cohen Hagadol after Ezra. Shimon Hatazadik’s tomb in Jerusalem. What is the meaning of these three pillars? Trying to decipher the meaning of the three pillars is very challenging. Does Torah mean the actual Torah itself or the entire corpus of Jewish texts or does it simply refer to the Jewish people’s belief in Hashem, is it related to the studying of the Torah, its acceptance or is there something more in this single word? However, before even evaluating the implications of these three terms, it is probably worth considering why there are only three terms listed here. Does the mishna imply that Shimon Hatzadik considered these three elements to be the most central to Jewish practise or are they representative of a range of other things which are connected, do they function as an umbrella for all the Shimon Hatzadik represented? Clearly each approach has value. In discussion, we agreed that three elements – Torah, Avodah (tefillah, prayer), acts of kindness – represent areas which we need to focus on when trying to improve our commitment to Judaism: Torah is representative of our relationship with ourselves and our need to continuously strive to grow through Torah learning, Avodah signifies our relationship with Hashem and Gemilut Chassidim, our connections with others – individuals and communities alike. Each of these categories requires constant attention and development, and, in order for us to be whole we need to build ourselves in each area. Furthermore, each is connected to the other. For example, through our study of Torah we come to realise the importance of our acts of chesed and the over-arching value of our relationship with Hashem. It is interesting that the three elements each build on the preceding ones. When you study Torah you realise the centrality of Hashem in our world and once you realise this you can appreciate the challenges involved in performing true chesed. Chesed is built on developing sensitivity towards others, caring about the feelings and needs of others. One has to step out of one’s self in order to do chesed and give chizuk or strength to those in need. Acts of Kindness can be as simple smiling at someone or saying thank you. We are easily overwhelmed by our own needs and can be quick to overlook the needs of those around us. The essential message of this mishna is that each of these elements is equally important – helping others is as relevant as learning Torah – and each is required for us to grow as individuals. However, the mishna also implies the need for balance between each of these commitments.